When you think of Arizona, do you imagine a hot, sandy desert full of spiny cacti and snakes that rattle? If this is the only scene you think you can find in the state, you're in for a big surprise. Driving north from Phoenix, you descend through the mineral-rich Black Hills, which glow pink and purple at sunset, into the lush oasis of the Verde Valley. Gazing north across the valley, you see the red sandstone cliffs of Sedona and, in the far distance, the blue San Francisco Peaks of Flagstaff—the highest point in the state. Here, nestled among the white limestone hills along Beaver Creek, you'll find Montezuma Castle National Monument. Though 900 years old, Montezuma Castle is still roughly 90 percent original, making it one of the best-preserved cliff dwellings in the Southwest. Montezuma Castle stands as the legacy of a people who thrived here in the Verde Valley, a people referred to by archeologists as the Sinagua. In the monument's museum, examples of their prehistoric weaving, pottery, basketry, sandals, jewelry, and tools reflect the skill and ability of these people, who survived and flourished in the desert. Through the artifacts and structures they left behind, we are able to peek back in time. Today's park environment, full of native plants and animals, is very similar to the backyard of an indigenous person 1,000 years ago. The crops farmed then—corn, beans, squash, and cotton—are still grown here in the Verde Valley. Walking along the paved trail below Montezuma Castle, under the branches of giant Arizona sycamores, you can gaze up at the intact wooden beams protruding from the plastered walls and ponder how you might have chopped down one of these massive trees with a stone axe and hauled it 100 feet up the cliff on wooden ladders. Although the National Park Service closed the Montezuma Castle cliff dwelling to the public in 1951 to prevent further damage to the structure, you can take a virtual tour of Montezuma Castle today. 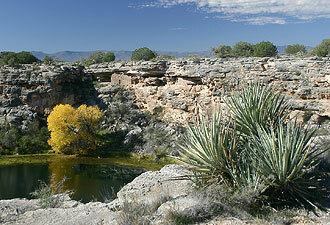 No visit to the park is complete without a trip to a special place nearby called Montezuma Well. Here you will discover a huge limestone sinkhole, spring-fed with 1.5 million gallons of water every day, all of which continually flows out through a prehistoric irrigation canal. The well is a unique aquatic habitat, home to organisms found nowhere else on the planet. When planning your visit, be sure to ask a park ranger about our daily programs so you can learn more about these extraordinary monuments. From December through April, join Ranger John Lewis for a free Sunday morning Bird Walk at Montezuma Well to enjoy the diverse bird species of the monument. 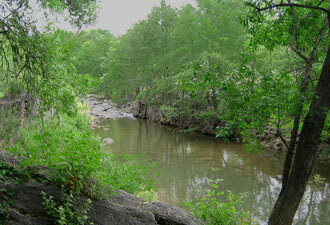 Who knows, you may spot a hooded oriole or hear the descending call of the canyon wren! Pack your lunch and take advantage of the shade in the picnic area, too. Whether you're interested in animals, plants, or geology; whether you want to watch birds or take photos; and whether you're on vacation or a local, there's something here for you. Arizona is so much more than sand and snakes . 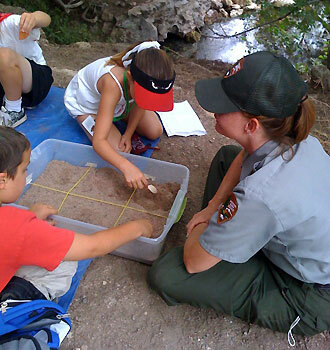 . . Come visit Montezuma Castle National Monument and discover the sycamores and Sinagua ingenuity for yourself!